The idea behind this novel fascinates me! I mean, it really is quite ingenious: make yourself look better by having a less well-looking person stand beside you and shine in comparison. It's like a theory I once read somewhere or saw on TV, how being in a group of beautiful people can transform someone from average to beautiful as well. It's really interesting to see how your perception can change because of your surrounding. So we meet Maude, one of the so-called 'ugly' girls. She's come to Paris to escape what would have been an unhappy marriage and needs a job. She gets hired by the Durandeau Agency and soon the Countess picks her to be the companion for her daughter. But unlike usual, said daughter isn't supposed to know Maude is making her look better. So Maude tries to become friends with the somewhat difficult Isabelle and slowly they get to know each other and actually do become friends. Until Maude has to choose between keeping her secret and keeping her friend. I liked Maude, I liked that you could feel that she wasn't worldly, being from a small town and just wanting to make her own way into the world instead of the one her father would have picked out for her. At times I was just cringing and wanting to yell at her to not be such a brat to her friends, and to stop being so UGH NAIVE! But it definitely felt like this was all in character for her, I just had this sense of foreboding you sometimes get. You know, the 'this has to go wrong SOMEWHERE' feeling. And I really liked Isabelle, who I can truly respect for wanting to just be MORE. Learn MORE. Be a scientist. Though I thought she could have been a little less contrary at times, she knew what she wanted and wasn't afraid to go for it. She did have a healthy dose of arrogance and entitlement that sometimes rubbed me the wrong way a bit, but I liked that once she's your friend, she's a TRUE friend, that's always a good quality in my book. It did sometimes feel a bit as if the countess was being evil just for the sake of it and didn't really seem to have her daughter's best interests at heart at one point in the story and that just felt a bit off to me. I get that she wanted to see her daughter get married, because hello, it's what having a debut and a season was all about, but you'd think she'd actually want her to get married to a decent person. 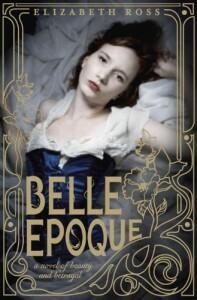 I really enjoyed Belle Epoque, I love that in the end there was a definite feeling of female empowerment and as I said at the beginning: the concept is just fascinating! Elizabeth Ross has written a strong debut and I hope we'll see more of her soon!